The Christmas Compotes by Dugan are perfect to display at Christmas time along with the very utilitarian Imperial Christmas Servers. We tried putting food or floral arrangements in the Christmas compotes, but the patterns are so perfect for the holidays; they don’t need any adornments. A long time ago when we first started collecting, a noted researcher and collector showed us an Imperial catalog that had the stretch Christmas Server with the candlestick in the center on the cover of the Christmas catalog. He was going to send us a copy. Long story briefly, we never did get a copy of the catalog cover. Has anyone else ever seen that catalog? We have since looked at lots of old Imperial catalogs, and haven’t even found this server pictured in any of the catalogs! The Imperial Christmas Server is perfect for serving cookies, fruit or whatever. It is a space saver with the candlestick in the middle and cookies, fruit, sandwiches, etc. on the server. If you want to be proper; the cupped servers were used for fruit or anything that could possibly roll off the server. The flat servers were for small sandwiches, petite fours, or other small cakes. Cookies as we know them, became popular in the thirties. Cookies are perfect to serve on the Imperial Christmas Servers. The Imperial Christmas Servers come in three colors: amethyst or Amethyst Ice; smoke or Blue Ice (on clear glass); and marigold or Rose Ice (most of the marigolds are a delicate marigold on clear glass) pieces. 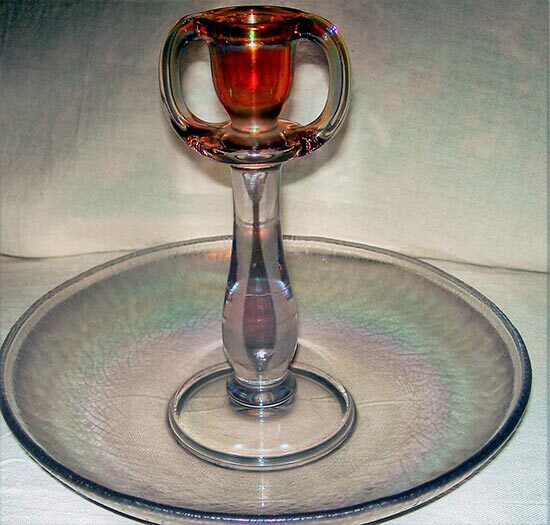 Many of the marigold or Rose Ice servers also have a light purple color from the sunlight. The Imperial Glass Company must have had Manganese in the sand as there are a number of items that have turned a light purple even some of their newer products from the 1970’s. The light purple gives the server more personality. Since this is the Holiday Season, we couldn’t resist the urge to also showcase the Dugan Christmas Compotes which are “Kissin Cousins” to the stretch glass pieces. 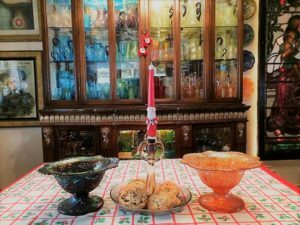 The first picture shows a marigold Christmas Compote (which has terrific iridescence but is washed out with the cream back ground) with the Diamond Cobalt Blue Crackle finish candlesticks. 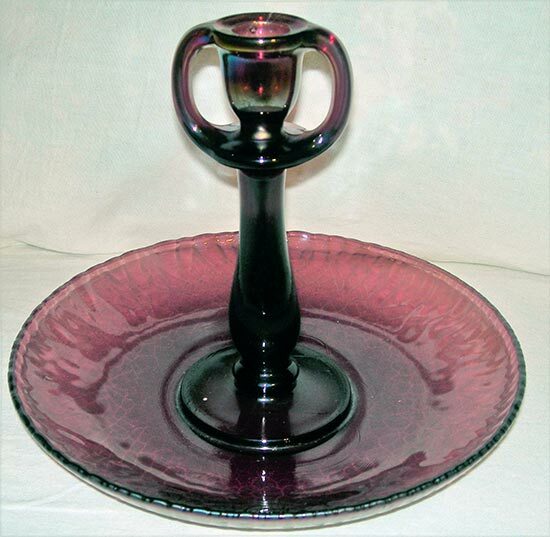 The second picture shows the amethyst Christmas Compote flanked by Fenton #549 Celeste Blue stretch candlesticks with black non iridized bases. [Left Picture: #749 & #549 Iridescent Celeste Blue with a non-iridized black feet and the third candlestick #749 Celeste Blue solid candlestick. Middle Picture: #549 Iridescent Topaz with black footed and a #549 Non-iridized Chinese Yellow (Opaque yellow) with a black foot which also non-iridized. The #549 8” high, the #649 10” candlesticks as well as the tall #759 12” candlesticks are fun candlesticks to collect. To make the two color candlestick: simply take two different colors of candlesticks from the same mold and cut them off at the same place; and fuse them together. If the candlesticks do not fuse properly or they don’t stand up straight, Frank Fenton said that you then have “marble cullet” which they sell to the marble factory. The Celeste Blue stretch with the black clear glass foot and the Topaz stretch with a clear black glass base seem to be the common colors which are still difficult to find. 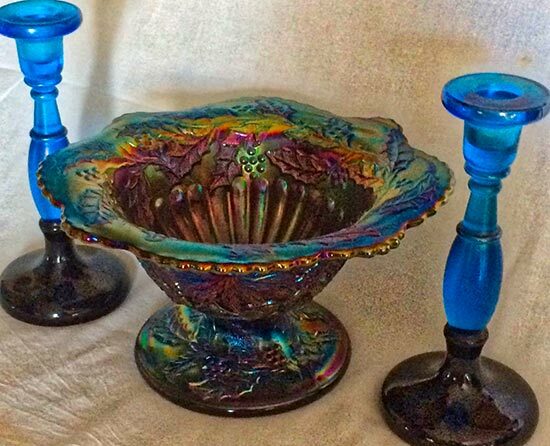 One fun unique pair of candlesticks has one candlestick with an iridized Celeste Blue body with an iridized Topaz foot. 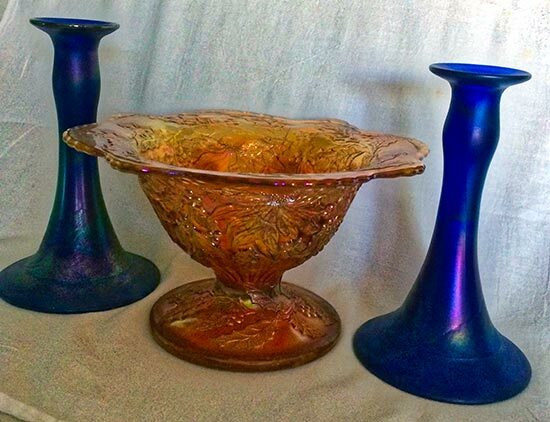 The other candlestick has an iridized Topaz body with the iridized Celeste Blue foot. This is the only set known with this color combination. 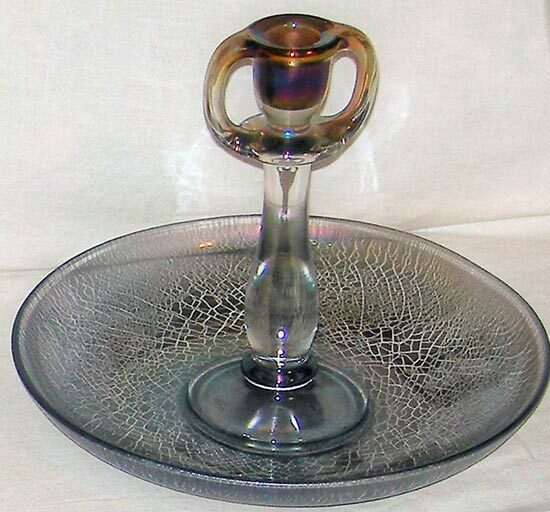 Fenton Art Glass Company certainly used the #549, #649 and #749 candlestick molds to very good use!